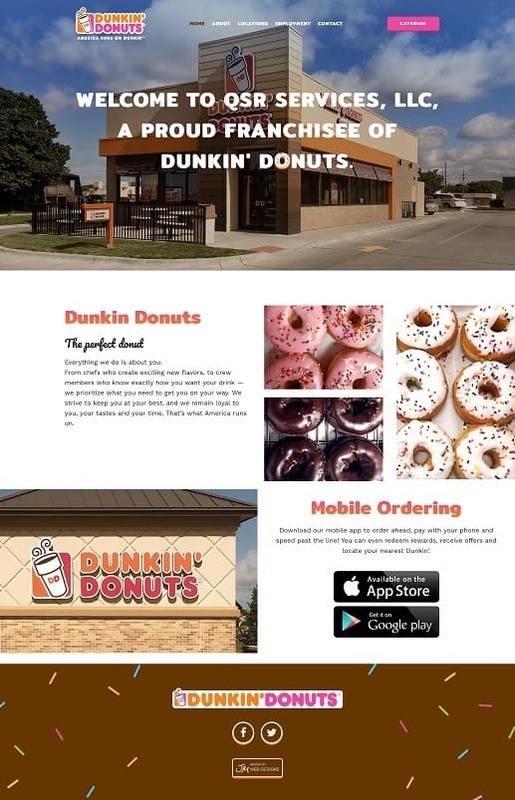 Our Omaha web design and development team is privileged to announce a new website for QSR Service’s Dunkin’ Donuts franchises. Because we love donuts and design, this website was great fun to pull together. While just a simple website, our designers took freedoms to incorporate Dunkin’ Donuts branding throughout. And our favorite part is the website footer – because, sprinkles. Also, be sure to check out the social media icons hover action for a sweet (get it?) surprise. This new Dunkin’ Donuts website is built on a WordPress Content Management System (CMS), through which QSR can update website content and images. This website also includes a locations map; managed through the CMS.